Get Clean. Stay Clean. : Patient Testimonies: Good News!!! It is a joy to work at The Coleman Institute and helping people get free from alcohol, opiates, benzos, Methadone and Suboxone every day! It is even a greater joy to see and hear about the results of our detoxed patients taking ownership of their sobriety and their lives after they leave us. Sometimes, unintentionally, faces and names get mixed up and details slip our minds. So, it is refreshing, literally, to hear back from patient's about their experience, strength, and hope every once in a while. 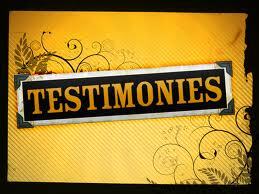 So, without further ado, here are two recent testimonies we received that we are celebrating this month. Would you join us in giving thanks for these two lives that are sober and thriving? "Just sending a huge thank you to Dr. Coleman I'm now approaching 10 years of being clean from heroin! I could of not done it without him!! Life is great!! So much appreciation!!!" "Just wanted to say 'Happy Birthday'! The Coleman Institute saved my life. I think of you guys everyday. Take care! * Names changed to protect anonymity and confidentiality.